ALL MY BOOKS ARE AVAILABLE ON INDYPLANET! Remember when comics were fun? WE DO. 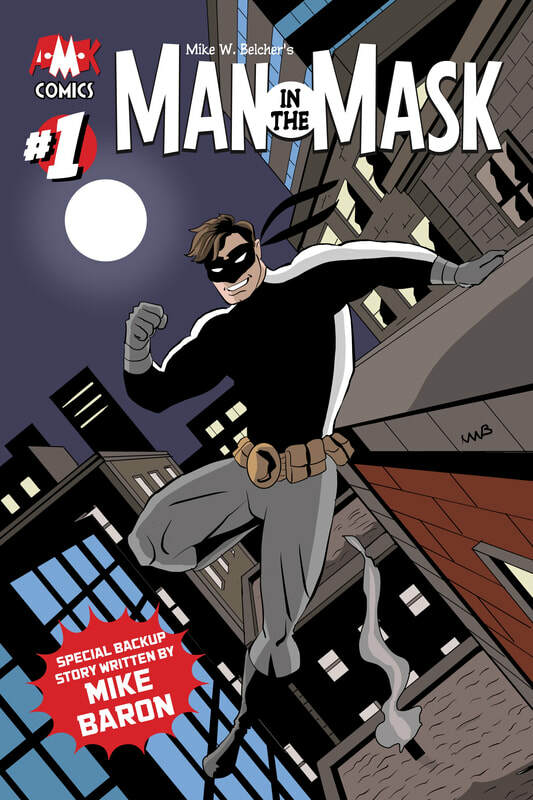 Welcome to AMK Comics and our exciting flagship title, Mike W. Belcher's MAN IN THE MASK, a story of one man's journey to a masked life and what it means to him. Whether it's in the pages of the short story, "IS THERE A MAN IN THE MASK?" where we learn some basics of the fabled masked man of Freebourne City. Then it's off to the story that introduces the full cast of characters entitled EMERGING FROM THE SHADOW, a 120 Page Full Color Original Graphic Novel. Within, you get to know the two Tommy's, a grandfather and grandson. And you get to watch as the mask gets passed on to a new generation of masked men. Debuting SOON, is the first issue of the new series following the graphic novel. SPECIAL BACK UP STORY BY COMIC WRITING LEGEND, MIKE BARON. Just finished MAN IN THE MASK: Loved it! Excited about the world and characters you've created. Can't wait to see more. Great twist with the ********* and *******. Well done! Loved it. Refreshing to read. Cool characters. A world where it seems not that far away. Takes me back to a simpler time for comics, but fun nonetheless. This is a true COMIC - slash - BOOK. It's a true comic in the sense that it has a real (dare I say it?) "old world" comics feel. (I know, I know - "old school" is the correct term, but I can't plug my company with Old School Comics!) The MAN IN THE MASK is a true mystery man from back in the day, and the comic itself feels soooo pulpy - you have to love it! But old school comics (okay - happy now?) were never this vibrant in black and white (or grayscale) as this book. It is the best black and white format I've ever seen. Just to look at this comic is a joy. But it's a true book, as well. Its readable without art. That's all you need to say about comic book writing. If the story can stand alone, then you've got literature. A lot of comics don't have that and believe they don't need that. You do, and "Man in the Mask" has it. If you believe that comics should be exciting to look it, moving to read, fun and filled with believable characters with a strong sense of hope and goodness, then you'll want a copy of "Man in the Mask". The writing is fun and moves the story along. The art is charming and the storytelling clear and accessible. I enjoyed the story and look forward to the rest, especially the narrator's journey.